Create an interactive tree control. The Tree View component creates an interactive tree control. 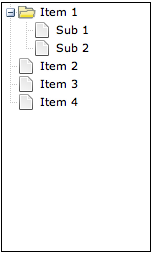 The tree control is a hierarchical list that can be used to simulate a menu or a folder structure. You configure the component by specifying the content hierarchy as a bulleted list, and by configuring its look-and-feel and level of interactivity. You specify content by creating a bulleted list in the Rich Text Editor. By default, the component includes a nested list of placeholder content. The content must be specified as an unordered list to render the tree. The default tree content is shown below. You can simulate a tree menu by manually linking the list items to pages. Highlight the relevant list item in the Editor canvas. Click the Insert/edit link icon in the Editor toolbar. To link to a project page, open the Link Picker and select a project page. Edit Content Open the Rich Text Editor. Animate Select Yes to use an animation effect when closing and opening nodes. Drag Drop Select Yes to allow nodes and leaves to be dragged to a new location in the tree. Show Lines Select Yes to show lines connecting nodes and leaves in the tree. Use Arrows Select Yes to use arrow controls to expand and collapse nodes. Icon Select Yes to use a custom node icon. Expand All Select Yes to expand all tree nodes by default. Checkboxes Select Yes to include a check box for all nodes and leaves. All Checked Select Yes to select all check boxes by default.